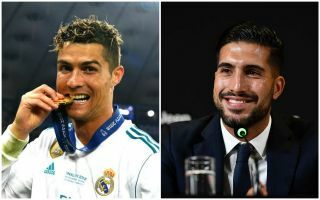 Former Liverpool star Emre Can has commented on the possibility of a Cristiano Ronaldo transfer to Juventus this summer. The Germany international says he does not know details about whether or not the deal is on, with Calciomercato today reporting that there’s some potential for things to stall. Ronaldo would undoubtedly be a superb signing for Juventus, having scored an incredible 450 goals during his nine-year stay at Real Madrid. The 33-year-old remains one of the best players in the world and it’s little wonder someone like Can would want to play alongside him if possible. The 24-year-old joined on a free transfer from Liverpool this summer after running down his contract, meaning Juventus should have a decent amount of money to spend on a big name like Ronaldo. Quite why Real would want to sell the Portugal international is anyone’s guess, but as speculation goes on Can responded to talk of a potential deal and said he would like it to go through if possible. ‘For any player it would be great to play with someone like Cristiano Ronaldo,’ he said at his Juventus unveiling, as quoted by Marca. ‘I don’t know, however, if there has been contact between the club and the player.